I joined Samson’s Fit Bodies Gyn in Plantation three years ago. I met Rob, my certified personal trainer, and his two beautiful children, Rachelle and Ryan. From the beginning I felt they made me feel as though was part of their family. I was glad to go, learn different exercises and become strong with Rob’s guidance. A year ago, I was stricken with the stroke which left my paralyzed, on my left side, arm, hand and leg. Rob and his family kept in touch with me showing me great care and support. When I was finally able to come back to “my gym family,” he gave me great joy. Rob helped me through the weakness, and I felt my strength returning. I say Rob is my HERO because without him I could never recover from the situation with such confidence. I thank Rob, his family and Samson’s Fit Bodies Gym for giving me my life back. Rob is the best in the business! I was not expecting much, since I have never been to a personal trainer. I thought it would be expensive, annoying, and non-sustainable. I was wrong! Rob is so much more than a trainer. He is very intelligent, caring, and insightful. He has tons of experience. He was also a professional wrestler, body builder, and soccer player. That is so cool! I get to workout with a celebrity!!! That said, he does not have an ego. He does not train people for the money. He does it because he loves helping people. After my workouts, I see him training children with special needs. I feel like I’m not even working hard in our 30 minute session, but I feel it the next day. In addition, Rob is a family man. His wife is super sweet and is also a trainer. He works from 7 am to 7 pm, but devotes all his free time to his children. If I end up even 10% as good as him, I’ll be happy. Many years ago, I was in good physical shape. Then, I had some issues with my Thyroid that prevented me from having much energy, so I discontinued exercising. I had not worked out for two years. When I decided to get back into the gym, I went to a large facility (will not name any names) with many trainers and a hyped reputation. My first experience with a personal trainer there was bad to say the least. The trainer seemed to have little to no formal knowledge. I was pushed too far in my workout and ended up fainting. I never went back there and had stopped working out altogether. Following that episode, I was very reluctant to ever try a personal trainer again; that was, until I went to Samson’s Fit Bodies Personal Training Gym. I met with Rob Samson who were very welcoming of myself and my fiance. I noted to them my skepticism for training and how my past bad experience had blemished my desire to move forward. They were very understanding and explained that in their gym there were no egos. They were great listeners and made sure that I felt confident at every level I moved toward. 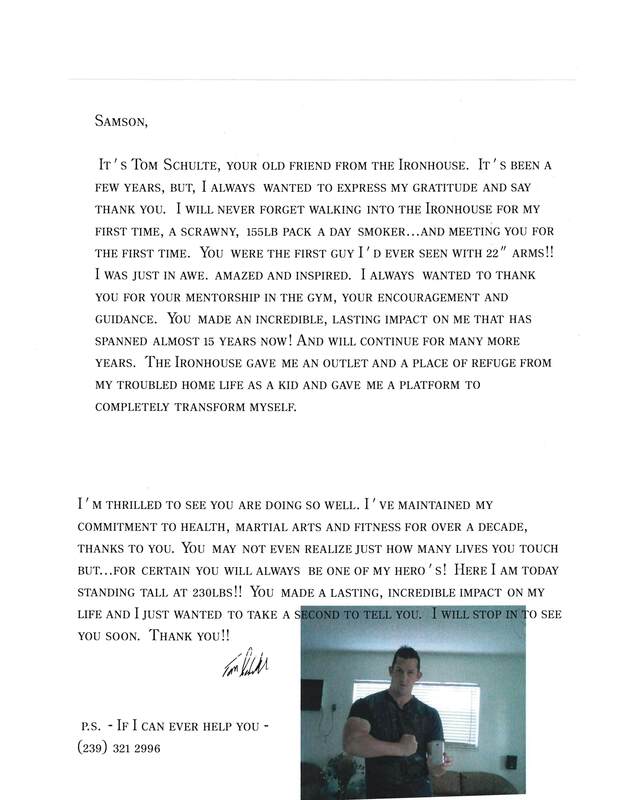 Since then, I have been training regularly with Rob Samson twice a week and have never felt better! I originally had only planned to train there until my wedding day. Now, I cannot imagine NOT going there. It is something that I look forward to twice each week, and I have more energy and look better than ever. I can easily say that working with a trainer is the best investment a person can make in themselves. If I were to work out on my own, I know that I would not challenge myself to be the best I could. The fun part is that Samson’s Fit Bodies is a warm, at home environment, where I can work out without the hustle and bustle of a large, corporate gym. I am fully focused on my exercise and can achieve more in one 30-minute workout there, then with many other programs combined elsewhere.